FairStars MP3 Recorder is a real-time audio recorder, offering professional recording features with full support for MP3, OGG, APE and WAV formats. It allows you to record sound directly from your sound card, including from a microphone or a line-in jack at high quality. It can be used to grab any sound, including music, dialogs from movies, game sounds, streaming audio or anything else. The captured sound can be saved directly to MP3, OGG, APE or WAV format, without the need for temporary files. In addition, the program includes a ID3 tag editor. Additional features include silent skip (Silence Detector), file size limits and more. Record audio from sound card directly to MP3, OGG, APE or WAV format with high quality. Record sound directly from plackback device(only for Vista). Real-time sound monitor before recording, easy to select record device and adjust the volume. Skip silent passages, stop recording or record to a new file automatically after a set time silence (Silent Detector). Stop recording or record to a new file automatically when reaching a set file length, size or time (File Limitation). Remove environmental noise automatically with the option Filters Setting. Support writing of ID3 tag when recording and showing when playback. Support ID3 tag view, import, edit, or transfer to the file in File List with TAG Editor and Tag Option. Easy Set feature for silent sensitivity. Easy-to-use user-friendly interface, and skin support. When you record from a microphone or a line-in jack, mark the option "Autosetting" in "Advance" page may remove the environmental noise automatically. If your registration code is invaild for the latest version, please contact us to get the new registration code by using your registration email address. 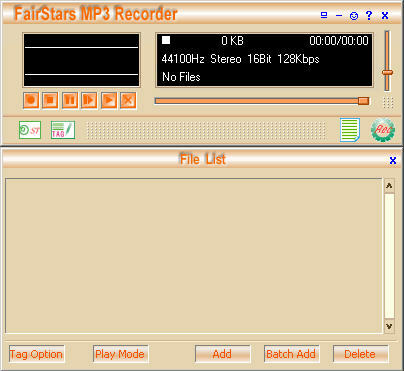 More FairStars MP3 Recorder Screenshots - Click each image to enlarge! It is a easy-using and high quality software for a complete recording. is a direct and real-time sound recorder software which offers professional recording features with WAV and AVI support. is professional software designed for recording audio from your computer to hard disk file of MP3 or WAV formats. records any audio source from your computer into MP3, WAV, WMA, OGG, and VOX files. is a sound recorder software which can capture audio from your computer to files of mp3 or wave formats.